Classic & Vintage Commercials details the growing hobby of vintage commercials. 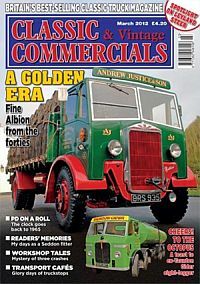 Right from the time of the heavy trucks of road haulage to present day stylish symbols of road transport, Classic & Vintage Commercials features interviews with owners, restoration advice and stories plus a unique look back at past vehicles using exclusive photographic archives and readers’ commentaries. In addition there’s news, an exhaustive listing of all the known makers and brands of vehicles and visual archives and photographs. The ideal magazine for those who love the beauty of classic and vintage vehicles and heritage behind each vehicle Published in English - Monthly. Allow 6-10 weeks for initial delivery. 4x4 Magazine has been providing its readers with the very best in automotive off-roading since 1982 and stands head and shoulders above the competition.